Bring your creative ideas to life with the 3Doodler create, the world’s first 3D printing pen! 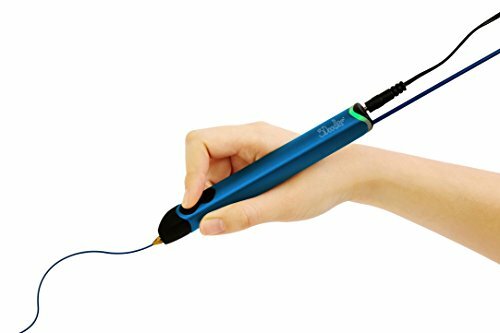 this highly versatile 3D printing pen brings a new level of creative expression allowing you to lift any idea off the page. Draw vertically. Draw horizontally. The 3Doodler create extrudes heated plastic, which instantly hardens, allowing you to draw in 3D, freehand or on paper. The possibilities are endless. Latest features include a new ambient light bar, enhanced design, and improved drive system for quieter & smoother operation. Offering the widest range of materials with over 75 plastic colors in Flexy, matte, gloss, clear, glow, or sparkle materials, plus accessories for all kinds of users - the possibilities for what you can create are endless. This innovative product is the perfect gadget for hobbyists, tech-enthusiasts, and makers of all levels. Each set contains: 3Doodler create 3D printing pen, 50 free plastic strands in a selection of 8 vibrant colors, power adapter, quick start guide, tools & a ton of creative potential! If you have any questions about this product by 3Doodler, contact us by completing and submitting the form below. If you are looking for a specif part number, please include it with your message.